Regarding a previous post on hair volume, someone asked me to develop more on hair powders — which are the best, what's the consistency like and how well do they work. Well, I've chosen three of my favourites to compare. First of all, I should really address the major concern when it comes to these products — do they really disappear on the hair? Yes, they do! Even though the consistency may change between them and some require a bit more work to massage it in, they do vanish quite easily. They're fairly easy to apply, as well. Just dust a bit of powder directly on the roots and massage it in. Voilà! Let's start with label.m Resurrection Style Dust. In terms of texture it's the least sticky from the bunch. The actual consistency reminds me of fine table salt and has to be worked in a bit more carefully. It provides body and consistency too, not just volume. I'd recommend this particular product to normal/coarse hair types, since it has to be worked in a bit more. 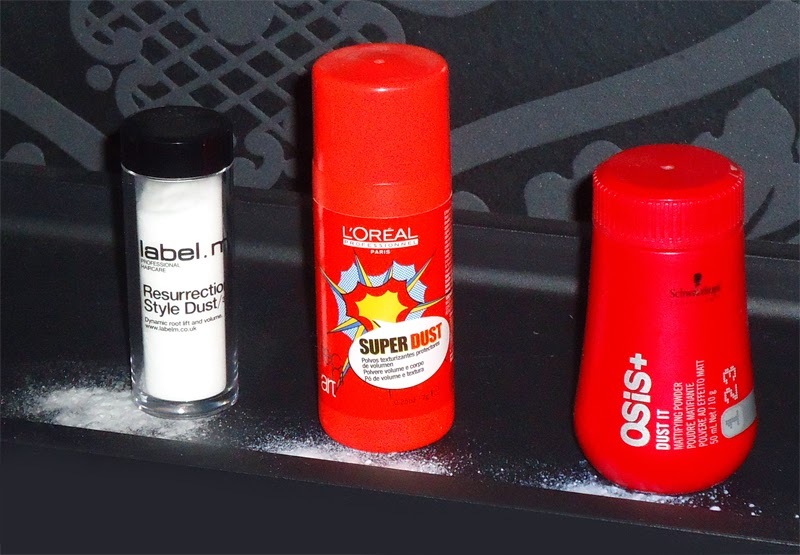 Second in line is L'Oréal Professionnel tecni.art Super Dust, a very fine powder — reminds me of powdered sugar, actually. It's very sticky, so it creates loads of texture even in fine, slippery hair. The best quality of this product is the foolproof application. If it's your first time trying something like this or, if you don't get on too well with styling products, this is for you! Also provides an unbelievable matte texture. To finish up, let me introduce you to the very hyped up — for good reason — Schwarzkopf Professional OSiS+ Dust It. This is a great all rounder. If you're a professional, add this in your kit. It'll work great on all hair types, it's very buildable and allows you to control the amount of volume and texture you put in. It's very fine, not as fine as Super Dust, but still... Plus, offers a lot of body and feels like there's more hair "naturally". So, pick the right one for you and start rocking that big messy hair!